Bosses are used in parts that will be assembled with inserts, self-tapping screws, drive pins, expansion inserts, cut threads, and plug or force-fits. Avoid stand-alone bosses whenever possible. Instead, connect the boss to a wall or rib, with a connecting rib as shown in the Recommended Design of a Boss Near a Wall (with Ribs and Gussets) illustration. If the boss is so far away from a wall that a connecting rib is impractical, design the boss with gussets as shown in the Recommended Design of a Boss Away From a Wall (with Gussets) illustration. 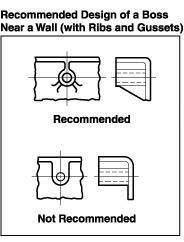 The Recommended Dimensions for a Boss Near a Wall (with Rib and Gussets) illustration and the Recommended Dimensions for a Boss Away From a Wall (with Gusset) illustration give the recommended dimensional proportions for designing bosses at or away from a wall. Note that these bosses are cored all the way to the bottom of the boss.